MARG has developed number of commercial properties like MARG Digital zone – I, Digital Zone – II & MARG Square and is developing the upcoming MARG Junction Mall on OMR, Chennai. Situated at Karapakkam on the Old Mahabalipuram Road (OMR) – the bustling IT corridor of Chennai & spread over 7.30 acres, MARG Junction Mall will be Chennai’s largest integrated development with a mall, serviced residences, club & banquet and a total built up area of 1.85 million sq.ft. 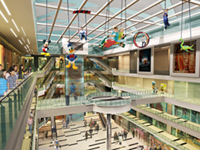 The mall is slated to be South Chennai's most happening & largest destination for shopping, leisure and entertainment. With the largest atrium of 24,000 sq ft in Chennai & 3 side road access, 1000 seater food court, 6 fine dining restaurants, 82,000 sq. ft. of double height gaming & sky adventure zone, 9 screen multiplex, parking space for 1300 four wheelers and 1800 two wheelers, 18 escalators, 23 high speed lifts and 6 travelators, the mall will have interest areas for all sections of the society and age groups and its layout gives utmost importance to convenient zoning and superior circulation. High visibility of shops from atrium and from various corners of the Mall is another key feature. 65% of the space in Mall has been booked by anchors, mini-anchors and other vanilla clients. With rentals firmed up, over 250 leading brands are showing keen interest in the mall. It will have a soft launch in June 2014 with above 80% occupancy. Mall buses will ply between Madhya Kailash and Siruseri on fixed timings and with mobile/ internet based applications as a convenient pick-up & drop facility by the mall, with the intent of tackling peak-hour traffic and decongesting mall parking. Free home delivery services planned for hassle-free shopping and doing away with the mandatory need for vehicles. Free car-wash for customers who come for shopping during non-peak hours. Covered cycle tracks on the service road side of mall, on OMR, for convenience of customers. The whole idea is to develop MARG Junction Mall as a community asset with a "human" touch. 153 spacious 2, 3 & 4 BHK serviced residences primarily conceptualized as large format, premium guest houses suitable for high networth individuals / corporates / MNCs, as corporate guest houses on rental basis or as own residence for leisure or weekend retreat homes are being launched soon. These serviced residences are will be housed in 2 independent locations within MARG Junction Mall & range between 1011 sq.ft. to 2063 sq.ft. With exclusive parking, a separate entry & exit, 100% power back up, central air-conditioning, access control, club, CCTV, cable & internet, club, exclusive terrace and best quality products in a ready to fit-out condition, the serviced residences will enjoy a pride of occupation in Chennai's IT hub. For more details on the exclusive features on the terrace, lifestyle amenities at the club and other specifications, click here. For more details on catchment highlights, click here. A large ratio of footfalls is expected to come from customers who are living in gated communities on OMR. Approx. 30,000 housing units are present on OMR and another 15,000 units are coming up. This is the catchment which has no other mall in near vicinity. Also, there are stand-alone houses and small residential complexes on OMR.